The Simple Life of a Queen: Sunshine? Faith, Family, Friends...this is what life is all about. Hello again my friends. It's Friday and although the sun was out for an hour or two, it's cloudy and a rain/snow mix is predicted this evening and tonight. It has been a bit nicer this week with some snow melt happening, although there is still at least 2 feet of snow in our front yard! I've gone to physical therapy twice this week. Tuesday, the therapist told me to go to the mall and walk one side only after I finished at their office. Thursday he told me I could walk the entire downstairs circle. This morning I went and walked the downstairs and upstairs circle. (Don't tell the therapist though. I think I was just supposed to do downstairs until he sees me again.) I can't believe how good it felt to get out and walk and how exhausted I am and how much I hurt after just that little bit. I have to go to the mall because he doesn't want me walking outside because of all of the snow and ice. Apparently the bone won't be fully healed for another 6-7 weeks so I can't risk another fall. This is how empty the mall is before the stores open. I'm not a shopper, so I like to go early before lots of people get there. At 8 or 9 a.m., there are only us walkers there. I'm a bit embarrassed when people 20-30 years older than I am go zipping by me. There are some people who go everyday and walk several miles. I would much rather be outside walking at the lake! 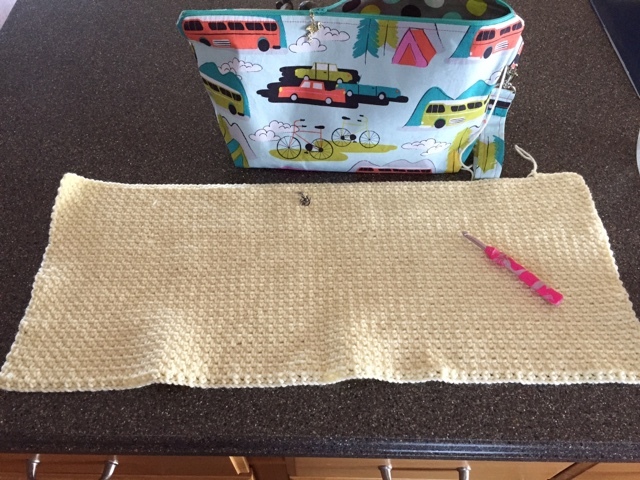 I started a child's sweater earlier this week. Here are the sleeves in progress. I've finally wised up in knitting sleeves. I do both at the same time on a circular needle so all increases and decreases are done on the exact same row at the other sleeve. This eliminates oddly miss-matched sleeves in case you're off a row or two. It only took me years to figure this trick out! Ha! And here it is completed. The bottom picture is more true color-wise. I just have to sew on the buttons. I'm not sure where this sweater will end up...possibly the Children's Shelter. A close up of the eyelets. The back is eyelet too. 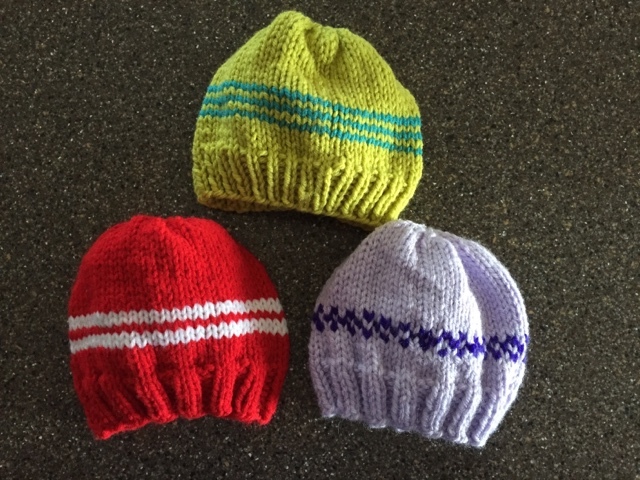 Three baby hats finished for the hospital. 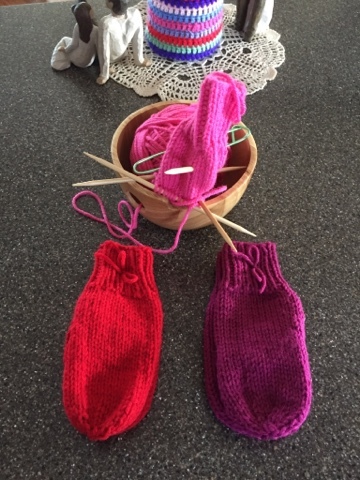 Two pairs of mittens and one mitten about 1/2 finished. I started this baby blanket yesterday but decided I didn't like it so about an hour ago I ripped the whole thing out. It's back into a ball of yarn waiting to decide what to be next. That's my sweet project bag from Kris. Love those vintage campers! Here was the beautiful skyline with Mt. 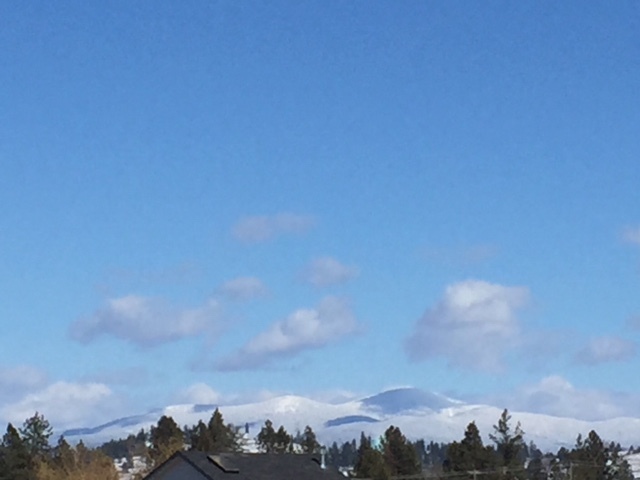 Spokane covered with snow and clouds. I took this from the back deck. Look at that blue sky. We haven't seen that much this winter. 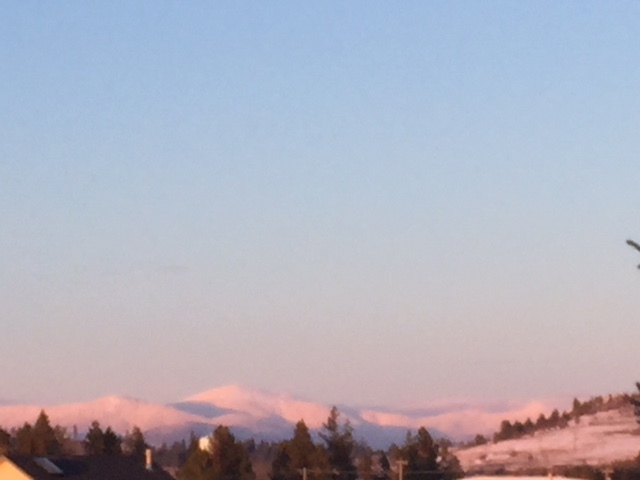 Sorry this is a bit blurry, but it's basically the same view that evening at sunset. That pink is gorgeous. Life has been very slow here. I did get my hair cut yesterday. It had been almost a year since it was even trimmed. I detest messing with my hair. She cut it MUCH shorter than I thought she was going to. It was over halfway to my waist and now it's above my shoulders. I had lots of split ends that had to be cut off. **sigh** I know I'll get used to it, but it's a really, really drastic change for me. Piper almost cried when she saw it this morning on FaceTime. She loved playing with my hair and we would braid our hair together on some days. Oh well, it is what it is, and it's only hair. And now I'm off to sit in my chair for awhile. It's been a busy day so far. I hope you all have a wonderful weekend and it is nice and warm wherever you may be. The doll blanket is so pretty and I know Piper is thrilled with it. The sweater is so precious...I love baby items and babies too! You are such a great knitter. How did you become so good? Do you ever make mistakes? How do you get out of them is you do? I wish you lived next door then when I mess up I cold run over and you could show what I did wrong!LOL! that's the problem....I don't even know! LOL! I also love your granny square blanket that you have laying over you. You are so prolific in your crafting and there are many recipients that are so fortunate that you are. The closest mall to me is 2 hours away so I'm glad yours is closer to you! I'm so glad you are feeling stronger and healing...it's wonderful! It will be lake time before you know it! P.S. Thank you for sharing your beautiful photos too! Fantastic news that you are mall walking! Easy does it girlfriend!!! I know you will be back to yourself soon. 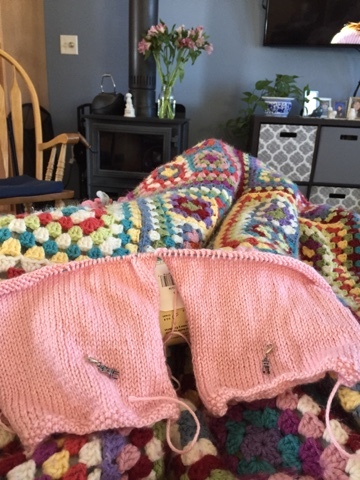 Love the doll blanket, and hats, and the sweet sweater! You are such a prolific knitter! The views of the mountain are so spectacular! It is quite Spring like here today. Just lovely. I have filled my bird feeders and am enjoying watching them from my sewing room window. Soon my beloved Bluebirds will be here to nest again. And my all time favorites, the magnificent Orioles!! Oh I am such a bird nerd! Continued healing to you Betsy. Summer and the lake are just around the corner!! Oh, I am SO thankful you were able to walk in the mall! How wonderful! God is healing you, my friend, even though it seems to be taking so long. I often think of how my dear Mom used to tell me that God has His own timetable. It surely doesn't line up with mine, but I suppose that is where trust comes in. Little Piper's doll blanket is just gorgeous, as are all of your other creations...oh, that little pink sweater! You are so generous and have such a big, loving, caring heart. Surely God is so well-pleased with you and all you do. Take care of yourself, and I do trust you are completely well soon. I am praying for you and sending hugs your way! Dear Betsy, I am delighted you are walking dear friend, and able to be out, but remember that pain is a warning from your body while it is still in healing stage I do think you need to be wise and listen to it. 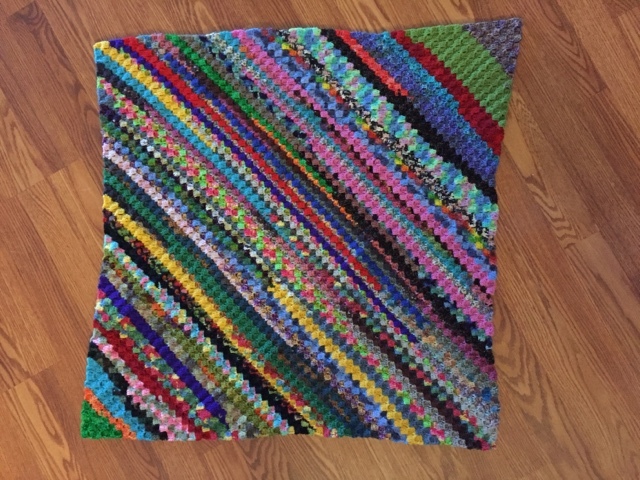 Loving your crotchet and knitting, you're doing wonderful work again and in such short time too... not sure why you didn't like the baby rug, I thought it was a nice stitch and showed up well on wool. Summer is drawing to an end here, but still warm and swimming weather if time permits. Sending hugs and prayers, from Downunder. I do sleeves that way too now. That sweater is adorable. I can't believe how fast you got it done. Your view is spectacular! How wonderful that you have a safe place to walk. Don't go too much further than the therapist recommends at the beginning even though you think you can. Too much could cause a relapse. The sweater is precious! 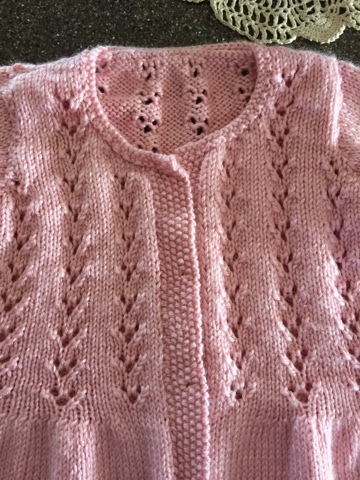 Love that pink yarn and the eyelets. That sweater is unbelievable. your charitable knitting is amazing. Someone will LOVE that. Cute sweater! I like the details of the front. Betsy, so glad you are healing well enough to exercise. Make sure you don't do too much too soon. Love the balnket and the little sweater. Your hair seems to grow so fast, don't worry about it. I bet you look fantastic. 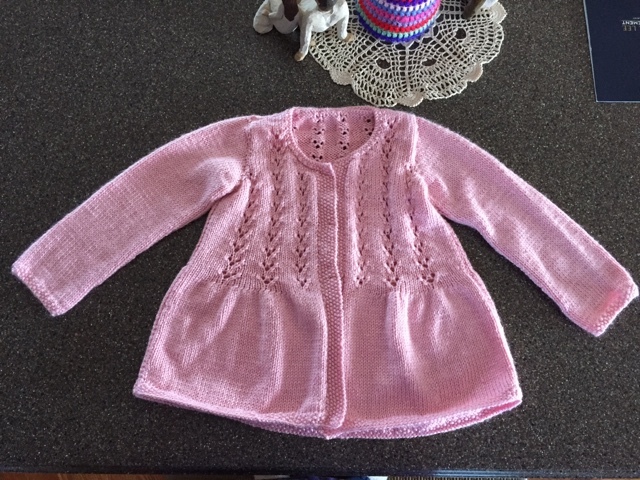 The little girl sweater is amazing-love both the pattern and color! SO happy 😊 to hear you are able to get out and about a little now. Hoping every week will see improvement and that you'll be able to enjoy time at your beautiful lakeside retreat come April. Sorry about your haircut...such unexpected changes can be difficult. I know how you feel. Walking at the lake would be so much nicer. But for now, just heal. Then, when Spring arrives, you will be able to enjoy walks outside. I haven't had my hair cut in a year either. Next month we are going to a wedding in Jordan. That means I need to buy a dress and high heeled shoes ... neither of which I enjoy wearing. And I may have to actually do something with my hair. :/ The little sweater you made is so sweet. You are always so productive and charitable. I want to wish you patience and support as you heal. 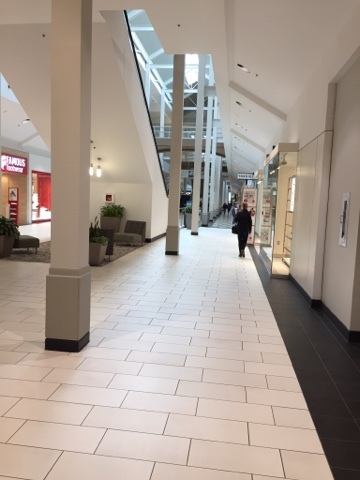 The mall sounds like a safe place - uneven ground will put extra stress on your joints and may even cause a new injury or exacerbate your current one. My local mall has an organised walking group that meets regularly. They all have group T-shirts etc. and enjoy making new friends as they walk. Does your mall have something like that? I am sure such groups would have walkers of varying abilities so there'd be no pressure to keep up with a group - people can walk with others who are at the same level. Whatever you do, however tempted you are, follow your doctor and physiotherapist's instructions. Certain injuries take a set amount of time to heal and there is no way of hurrying them up - doing too much can set you back. It is so hard to be unable to do the things you want to do, but, in time, you will get there. Enjoy the good things about where you are right now. It will be easier to cope than allowing the frustration to take over. It isn't easy, but slowly, gradually, eventually you will get to where you want to go. Take care! I feel for you. Sending a healing hug. I'm so glad you've decided to read my blog. God has truly blessed my life and I'm happy that you've joined me on my journey. Please be sure to leave a comment so I know you've visited me. I would love to have you tell me about yourself. I spend most of my days knitting and crocheting for different charity's both local and around the world. I also enjoy visiting a local assisted living facility and knitting with some of the women there who have no family to visit with. I'm a wife of 40 years to a wonderful, patient man and also a mom of 3 and grandma to the 3 most beautiful grandchildren in the world. Mom to Chloe, our shy golden lab and most importantly, a follower of my Lord and Savior, Jesus Christ. Two Thieves - Was Good Friday GOOD for Them?